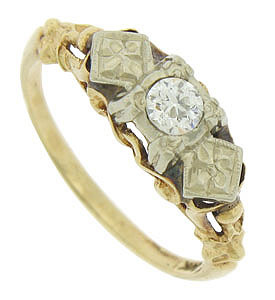 This elegant vintage bi-color engagement ring features a detailed, cutwork band fashioned of 14K yellow gold. 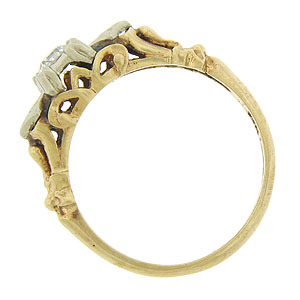 The center white gold mounting is decorated with organic floral engraving and set with a dazzling round cut diamond. The Retro Moderne ring measures 5.38 mm in width. Circa: 1940. Size 6 1/2. We can re-size.